Ugelstad spheres. Those tiny plastic spheres with unnatural colours that you see in toothpastes (and some facial scrubs). They are too tiny to be caught by municipal water filters, they easily flow into the world’s oceans, lakes and rivers. In water they can break down, releasing toxins, or become coated with other poisons, such as PCBs. 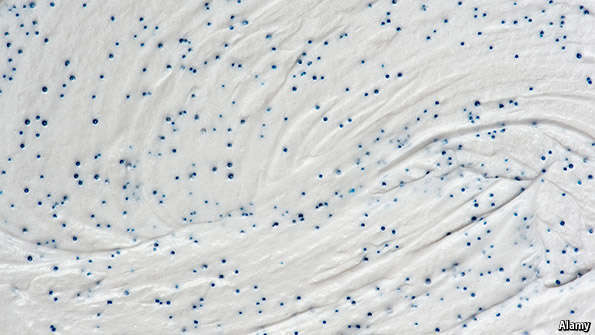 “…On July 30th Canada’s labour minister declared by the shores of Lake Ontario that microbeads will be considered a toxic substance. The government now plans to prohibit the manufacture, import and sale of “personal-care” products that contain them. Eight American states have already enacted bans, starting with Illinois in 2014. The Illinois ban does not apply to biodegradable microbeads, though their safety is unproven (it is unclear whether or not Canada’s will). California and New York are contemplating tougher restrictions. Four European countries, led by the Netherlands, are pressing the EU to prohibit their use in cosmetics.